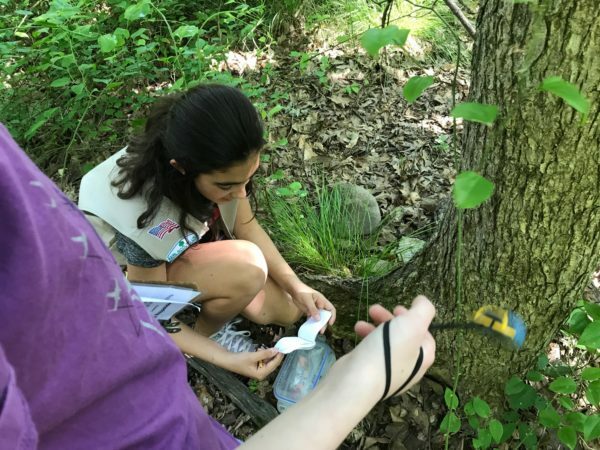 Last week, we took our 6th grade Girl Scout troop on a field trip to the Great Swamp in Chatham, where we got to try Geocaching. It was pretty cool! Geocaching is an outdoor activity in which small containers or "caches" are placed at certain GPS coordinates and registered for others to find on a site like geocaching.org. The cashes usually contain a logbook for those who find it to sign in, as well as some items for trading and some even have coins or tags that users hope will get to a specific destination by hopping from geocache to geocache with the help of their own online logins. The caches can be placed by anyone. That person registers them and usually has a geocaching name that doesn't seem to be their actual name. The ones we were looking for were set by someone who goes by Old Navy. It was a hot day, but it wasn't raining and the Great Swamp is mostly in the shade. The girls were excited - after a brief informational meeting with our guide, they each got their own GPS device to use, preloaded with several geocaches on the property. These were on loan as part of our group trip, available to book at the Great Swamp Outdoor Recreational Center. You could buy your own for about $40 or use an app on your phone. And the Outdoor Education Center will give you a map and the coordinates. This is something you can get information about at many park locations all over the place. My colleague, Laura, looked for some at Duke Farms. The trick, we found, was that the cache was never far from a trail, but the GPS device might point to it from another, father section of trail. We had to use our map reading skills as well as the GPS. Since we weren't driving, that wasn't too hard. There were two caches that were virtual, meaning we had to get to the coordinates on the GPS and then answer questions about the area asked on a sheet of paper we were given as we embarked. The others were physical containers - most tupperware, one a military ammunition box. Inside were what can best be described as trinkets: trading cards, simple fabric bracelets, notes from other scout troops and the like. We didn't bring anything to trade, so we just looked at the contents, signed the logbook and put everything back in place. Unfortunately, we also didn't bring bug spray, and heat plus swamp equals mosquito cloud. We found our only defense was to move fast. One girl was returned to her mom with a few small dabs of blood on her legs, probably from mosquitos, but maybe from the thorny underbrush we traversed to get the first geocache. We all had at least a few bug bites and I think my colluder (A Madison Mom's own Colleen) would be well suited with the geocaching handle "Mosquito Bait." It was a lot of fun, and there are about half a dozen caches in a mile and a half of terrain near the Outdoor Education entrance of the Great Swamp. At their other location in Pyramid Mountain, there are more with some more challenging locales that I know I'd like to try this summer.